Displays moderation actions sorted by date in posts/announcements/profiles/User CP (github-like). Note 2: avatar maximal dimensions settings won't work until this MyBB bug gets fixed: http://community.mybb.com/thread-164490.html Reports for it also will be ignored. EDIT: fixed in 1.8.5. Note 3: moderation actions are displayed for users in groups with Moderator CP -> Can view moderator logs? option ticked. 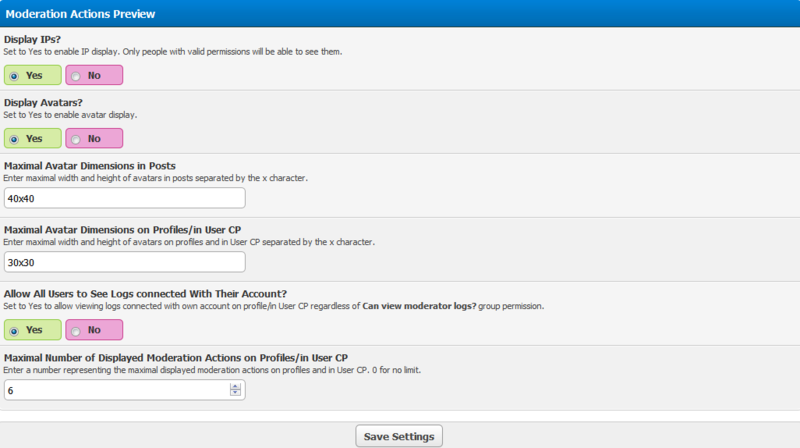 You can enable it together with the Yes, users of this group can access the moderator CP option disabled if you don't want users to be able to access logs in Mod CP. Plugin Library is required for template installation. After uploading it ignore the compatibility warning. Get Plugin Library (check Requirements section for more info). Install and activate plugin in ACP -> Configuration -> Plugins.